Peel the ginger root with a sharp knife or vegetable peeler. Grate or finely chop. Set aside. Add water and sugar to a medium saucepan. Cook on medium heat until sugar has dissolved, stirring frequently. Bring to a simmer and add grated ginger. Reduce heat to low. Cook 5 to 10 minutes, until shrub is fragrant. Remove from heat and let cool slightly. To make a mocktail, add shrub and pomegranate juice to a cocktail shaker filled with ice. Shake vigorously. Pour into 4 champagne flutes. 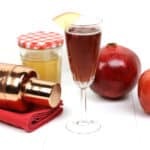 Top with Martinelli’s Sparkling Apple-Pomegranate. Sprinkle in 6 to 10 pomegranate seeds for garnish. Want to make this a cocktail? Add 1 ounce of vodka to the cocktail shaker.